Hello: My wife Martha, hereafter known as "the wife," says I can join the group if I'm nice and follow her rules. So, I'm fifty-two and retired. She made this board sound wonderful in our discussion last nite and this morning, so I'm joining as the wife's alter ego, Mr. Doom and Gloom. Since this is primarily a how to get enough money to retire early and comfortably board, I think a money profile will describe me best: If $200,000 fell from heaven and dropped into my lap, this is how I would invest it today. 1)$50,000 in BMN, a closed end fund. This a short term target muni fund that pays about 5%--w/ monthly dividends. I would use it as a higher paying MM fund. It's filled with AAA rated bonds. 2)$50,000 in Algonquin Power Income Fund, a Canadian fund that pays a monthly dividend totaling 8%/year. It owns hydro/electric dams, manages water systems, and develops alternate fuels such as methane (my favorite gas). 3)$50,000 in AOF, another closed end fund filled with US treasuries (65%) and other sovereigns, a partial hedge against the collapse of the US$ someday and decline of the DOW. 4)$40,000 in Rydex double down funds. Nothing more to say here. 5)$10,000 for me as a finder's fee. Don't tell the wife. "I love the smell of napalm in the morning...smells like victory"
Martha, have you finished deleting/editing all those other posts where you tell us about your spouse? I suppose this means no more flirting? Looks like you're a dividend and equity averse type. You'll have a few friends here, although even folks like me that like dividends and dont like the looks of the stock market these days still own some, cuz you pretty much have to. After vacilating between the deflation-inflation conundrum for the past three years, I finally broke to the deflation side over the past couple of months. I like what Hoye said in the article I posted before. It's a brief history of bubbles and the consequences. I'm slowly extracting myself from most commodities. A few weeks ago Richard Russell said that 'just about everyone is long inflation." This struck a chord with me. Everyone is long the stock market and their homes and, of course, debt burdens are lessened by rising inflation. It looks to me like everyone is on one side of the teeter-totter. So . . . almost immediately I've decided to crawl over to the other side. Emphasis on crawl. I'm about 1/3 greed and 2/3 fear. I don't like to vacilate too much, so when I do my DD on a stock or fund I spend most of my time worrying about how much I can lose on this position and a lesser amount worried about how much I can make. When I do this, I end up looking at income and value plays rather than potential 10 baggers. I have been dreaming about this kind of event ... it has not happened. It seems that your choices are very conservative, income oriented and tax managed. One question is that what's the goal? How is this $200K related to your other investments? You need to look at it form an overall portfolio perspective. Apocalypse wants to talk about investments, but we boys on the board just want to talk about how cute Martha is. She owned me one she put food products on her dogs heads. Welcome! Glad to have another voice of reason on board. I'm still learning, my post count reflects my incessant questions of all those who appear knowledgable (like Martha), so prepare for a good peppering! Who offers this fund for IRA's? I would be a basket case personally if I took your approach. I would probably spend my entire retirement worrying. Looking back over my last 40 years, there was always something to worry about! I remember Ravi Batra (Princeton prof) that was predicting the "Great Depression of the 1990's". I was thinking - yeah well I probably should sell all my stocks and get theat cabin in the mountains. I also would have little confidence in myself to predict market movements. But if it works for you and you are comfortable with it, go for it and good luck. And Welcome to the board! 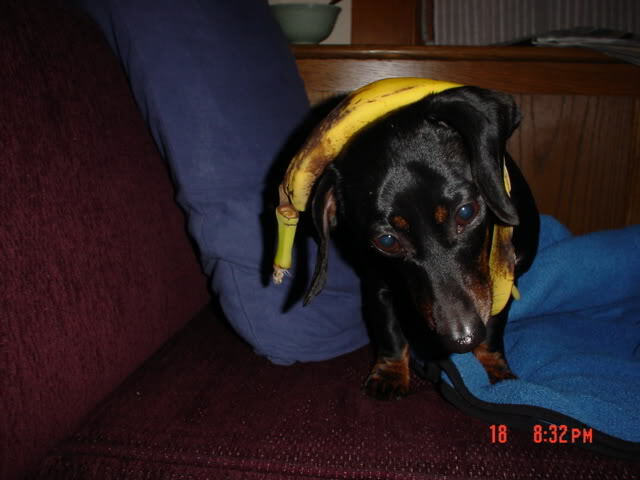 And yes like TH, Martha won me over with the Peelings on the dog's heads! I'm with you CT, I worry to much to have the responsibility of trying to make the kind of investment choices my DH makes. Everybody likes Martha, so you will have a hard row to hoe to be as popular. Did you say Doom and Gloom? We have some D and G'ers already, whose predictions that the sky is falling are usually (not always) premature. However, I think it was Buffet who advised that when it comes to investing "the power of negative thinking" is the way to go. Always invest with an eye toward "what if I'm wrong". Sooner or later, you will be. Thus, asset allocation keeps you in the game. Anyway, great to have you here. The wife also has a series of "bird with hat" pictures. I made that hat (Don't forget: boys were taught to like naps and snacks and toys by their mothers--I blame everything on the women). Someone other than the DH needs to ask Martha if they want to see those pictures. That is one peculiar hobby, honey. I think I'm ashamed to be a participant . Just thank god you dont have a rabbit. APF-FN.TO or AGQNF Talk to your broker first if you haven't purchased anything from Canada. The Canadians tend to have better paying dividends, so I like them. There web site is www.algonquinpower.com. Watch out for the exchange rate conversion. $C=approx. $.75 right now. Can Roys (Canadian Royalties) are also nice if you want a large dividends. They buy oil or gas fields and pay out a regular income stream, so to speak. Good Luck. My problem is that I think we're currently in a bull cycle of a secular bear market, kinda like 1930-31 of the Great Depression. I'm gradually working toward (over the next six months) as much security as I can find. If I'm wrong, I don't make as much money as an index fund or well diversified portfolio would; if I'm right . . .um. . . .